Rewind is today's stamp highlight. 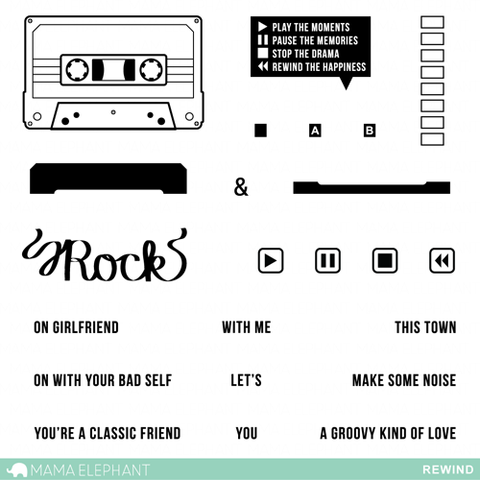 Let's make some noise and rewind back in time where we all donned our walkman and grooved to the music from our stacks and stacks of cassette tapes! This set will certainly bring a smile to those who would like to reminisce. Our Design Team sure ROCKED these projects! The cassette tape with a paper pieced label pops against the bright colors behind. How about the cassette coloured in primary colours? The enamel dots give life to the cassette stamp and it looks like it has something fun to tell us! 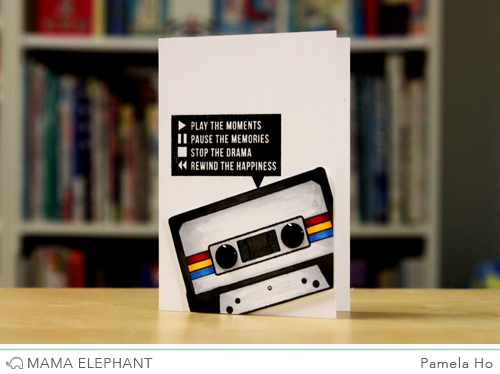 Emily's cassette tape anchors a three-part sentiment created by combining several words and phrases from Rewind. The ampersand from Index Card Creative Cuts, animals from Carnival Cupcakes and sweet little speech bubbles from Polaroid Fun tie it all together. 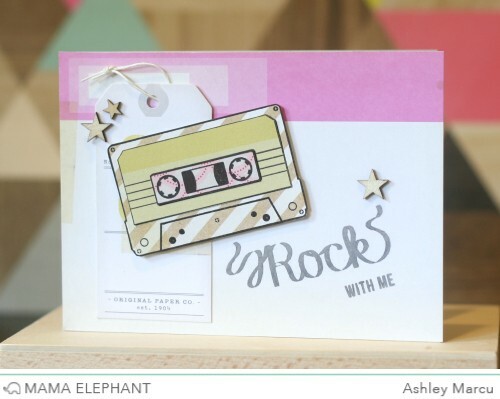 Ashley's card is perfectly paper pieced with a soft grey sentiment that totally rocks! Love this stamp set and these cards!! Can you believe that the kids born in the millennium probably have no idea what a cassette tape is?!?! I feel so old!!! yep i had a cassette tape sticker and my 8-year-old nephew asked what it was. i tried to explain it but he didn't get it. lol! These are adorable! This set is so nostalgic, oh the memories! Lovely cards. Shows off the stamp set beautifully. Great set. I love all the cards. I really need this stamp set! what an awesome stamp set and projects!!! rock sentiment can be used alone and coming from the cassette. 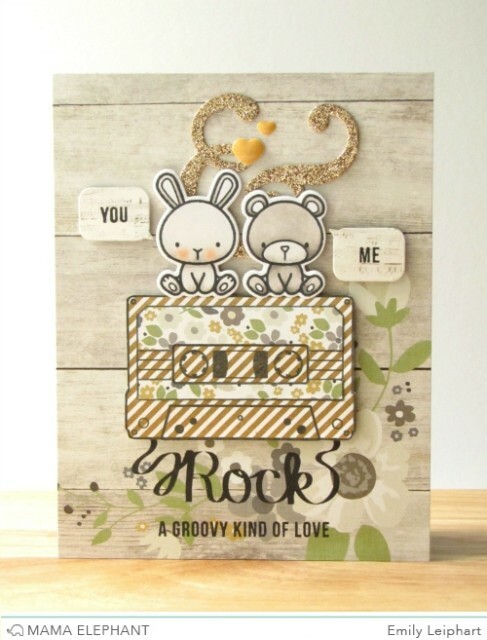 Fabulous cards - love the font on Rock! The stamp set looks awesome! I love this stamp because it remainder me of myself! I used tone of tapes when I was younger! Very fun set! So many tapes to remember.